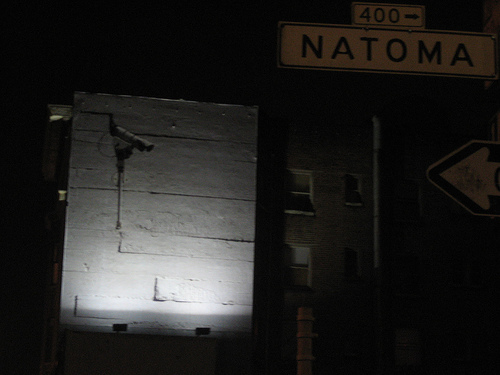 Ted Rheingold has the scoop on an awesome surveillance camera billboard prank at the corner of 5th and Howard Streets in San Francisco. Here’s his initial write-up, follow-up report and Flickr photoset. But this is one of those pranks where the jokes on us. The prankster is using superlative to remind us the society and culture we have come to accept: surveillance cameras on all sides; facial recognition reviews; and even nationwide car journey monitoring. If you can’t see a giant surveillance camera out your window, I don’t think you’re looking hard enough. UPDATE: SFGate: Culture Blog! did some more research and discovered the project behind this and other billboards is the Double Take a Billboard Project, in conjunction with New Langton Arts, The Creative Work Fund and Clear Channel Outdoor (shocking, I know). Here’s Ted’s follow-up.